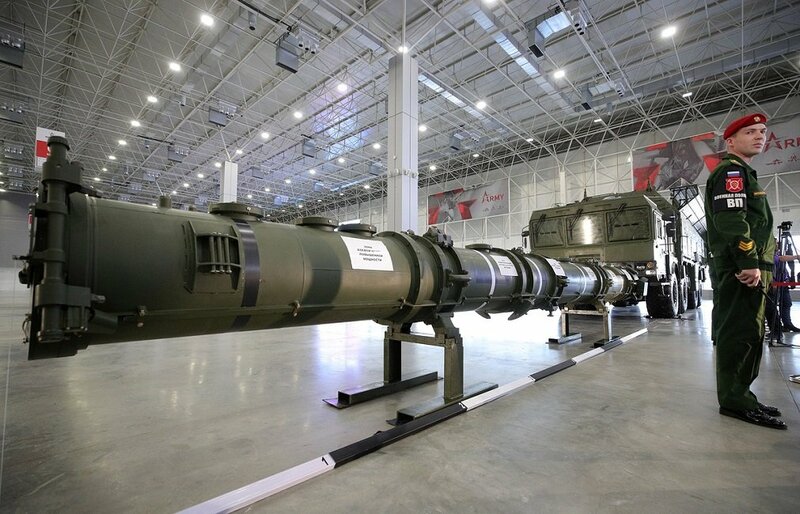 KUBINKA, the Russian Federation (BulgarianMilitary.com) – Russia’s Ministry of Defence, at a special presentation, for the first time has shown to foreign military attaches the 9M729 cruise missile that is said to be the reason for the U.S. withdrawal from the INF Treaty, learned BulgarianMilitary.com. The presentation reveals the 9M729 missile specifications, amid the U.S. claims that by testing it in ranges prohibited by the accord, Russia has violated the INF Treaty, and the following U.S. announcement to start their withdrawal process from the treaty on 2nd February for the lack of proof that Moscow stopped the alleged violations. The Russian Defence Ministry also displayed a modified Iskander-M launcher that launches 4 9M729 missiles, unlike the previous version – 2 9М728. Due to the fact that 9M729 is 53 cm longer, than its predecessor the launcher platform was also upgraded. At the news briefing on the cruise missile for the military attaches and media, Lieutenant-General Mikhail Matveyevsky, the Chief of the RF Armed Forces’ Missile Troops and Artillery, stated that 9M729 missile of the Iskander tactical missile system, did not violate the INF Treaty, given that it had a range capability of 480 km. He reveals that the 9M729 missile is equipped with new onboard control system that provides higher accuracy of the missile’s strike. The weight of the missile was increased due to its extended length when the warhead and the control system have been finalized. The Russian general said: “As a result, the maximum flight range of the 9M729 has decreased by 10 km compared to the 9M728 missile and equals 480 km,” and added that this was confirmed during the strategic command and staff drills Zapad-2017 at the Kapustin Yar range. Matveyevsky stated that the 9M728 and 9M729 missiles were furnished with the warhead and supplied with fuel only in factory conditions, and stressed “the fuel mass provides for the maximum designed flight range limited by the INF Treaty.” Its delivery is in in special containers, so the missile cannot be refueled in the troops and the mass cannot be changed. He emphasized on the fact that in the troops the missiles are stored and maintained on their launchers where and the maintenance work is carried out. Matveyevsky said: “Russia has observed and continues strictly observing the points of the Treaty and does not allow any violations,” and called the repeated U.S. accusations to the contrary “groundless”. Today, at a joint news briefing by Russia’s Foreign and Defence Ministries, which was devoted to the 9M729 missile, the Deputy Foreign Minister Sergei Ryabkov defined as “absolutely unacceptable” the U.S. demand for Russia to eliminate all cruise missiles 9M729. “The US delegation arrived in Geneva for inter-departmental consultations over the INF Treaty with the sole purpose: to read out statements written in advance to the effect that Russia rejects the ultimatum demanding our unilateral concessions implying verifiable elimination of all 9M729 missiles, their launchers and related equipment. Naturally, this kind of approach by no means looks like a diligent attempt at achieving a solution that would suit both sides and is absolutely unacceptable for us in gist and content,“ the Russian Deputy Foreign Minister said. Ryabkov’s statement stresses that currently, at today’s event, Russia is demonstrating its 9M729 cruise missile to representatives of the Collective Security Treaty Organization (CSTO), BRICS, EU, NATO, and of certain other European and Asian countries, by inviting them to attend, and thus providing an opportunity “to make a true picture on their own.” However, the representatives of the U.S., UK, France, Germany, the EU and NATO didn’t attend the ministry’s briefing on the missile. The diplomat also expressed hope that today’s explanations related to the 9M729 cruise missile, would provide another chance for a dialogue with the U.S. on preserving the INF Treaty. On 15th January in Geneva, Russia and the U.S. held inter-agency consultations on the INF Treaty. Then, Washington again accused Moscow of non-compliance with the document. Following the meeting, the Russian Deputy Foreign Minister Sergei Ryabkov said that the U.S. had not even tried to bring the positions of the sides closer, making it clear that it was determined to implement its plans to destroy the arms control agreement. In turn, the U.S. State Department’s Under Secretary for Arms Control and International Security Andrea Thompson, who led the U.S. delegation, once again accused Russia of breaching the Treaty and announced that Washington would start the process of pulling out of it on February 2, unless Moscow dismantled its 9M729 missile, which, according to the U.S., has a range capability that exceeds the 500 km limit stipulated by the INF Treaty.